The "Mother Sea-Goddess (Matsu) Fish" or the Indo-Pacific humpback dolphin (Sousa chinesis) is grey when born and develops grey-blue freckles during youth. It turns white or pink when fully mature, thus it's other popular name in Chinese meaning "pink dolphin." Local people from fishing villages have named the animal after Matsu, the Sea Goddess, perhaps as result of seeing the Sousa most often around Matsu's birthday in March/April when the seas return to a calmer state. The animals can be found in the temperate and tropical waters off the Indian Ocean and western Pacific Ocean. Their preferred habitats are transition areas close to shore, particularly estuarine waters. After several years of observation and research, the FormosaCetus Research & Conservation Group have found that the animals living along Taiwan's west coast differ considerably from their counterparts elsewhere and are likely a distinct subspecies. This would raise their level of importance at least to that of the Formosan landlocked salmon (Oncorhynchus masou formosanus), which appears on Taiwan's currency, and on the conservation of which the government has lavished much money and attention. Officials are not doing nearly enough for the animal given the fact that a very optimistic estimate of the number of these dolphins is no more than 200, with the actual number being most likely about half that number. There is a high likelihood that Taiwan's entire population will become extinct within the next few years threats to their survival are not greatly and immediately reduced. The dangers facing the Sousa are inter-related and straightforward. Simply put, their homes are being destroyed. Habitat is disappearing through so called "land reclamation" projects while the quality of water in which they live and feed has become degraded to the point where there is insufficient food. Over-fishing and unsustainable fishing practices are taking their toll, and many of the animals observed are injured, apparently the victims of hit and run by fishing or other vessels or entanglement in fishing nets. At the same time their echolocation abilities are impaired or threatened by noise generated from factory and coastal construction, offshore windmills and so on. That the Sousa's numbers have been reduced to less than 200 is due in part to their limited and rapidly disappearing habitat. It is believed that they may only be found within the area less than five kilometers from the shoreline running along the west coast of Taiwan from Miaoli in the north to Jiayi in the south. This happens to be an area of some of the most intense existing or planned development in Taiwan, development that competes directly for land, water and other resources with the dolphins. Examples of this development include the 2000-plus hectare offshore petrochemical plant operated by Formosa Plastics in Mailiao, Yunlin with another petrochemical plant planned for the neighboring township, Taisi, in a joint venture dominated by China Petroleum Corporation. Meanwhile, in the Taijhong Harbor Industrial Park the first stage of the state-owned China Steel Affiliate, Dragon Steel, is in operation and a major expansion plan has been approved by Taiwan's Ministry of Economic Affairs; Formosa Plastics is also hoping to get into steel production, and the MOEA has approved its application for a steel plant next to the abovementioned new petrochemical plant in Taisi. 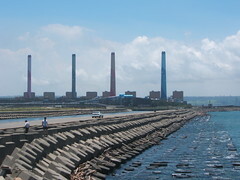 The Taiwan Power Company plans to build a coal-fired power plant in the Jhangbin Industrial Park, less than 20 kilometers from Asia's largest such plant in Longjing, Taijhong County, while a consortium between JP Power and local companies is applying to build its own coal fired plant next to the TPC facility. All of these are located right in the center of the land adjoining the dolphin's home waters. Then there are the continued land "reclamation" projects begun two decades ago and which have already decimated the majority of the coastal area that serves as the dolphins' home. The Taijhong Port, the Jhanghua Offshore Industrial Park, the planned new offshore park further south in Jhanghua, and the petrochemical factory-related reclamation projects in Yunlin will all hasten the reduction of their habitat. Fishing, recreational and commercial port construction and expansion plans are also in the works for Jhanghua and Jiayi Counties, while a number of factories and waste processors have recently gotten the go-ahead to relocate or consolidate their operations in the Taijhong Harbor and Jhangbin Industrial Park (e.g. Taiwan Fertilizer, VACRS Waste Treatment). Several reservoirs and other waterworks are also in various stages of planning and construction, including the Hushan Dam and the Tadu and Babao Weirs, which will increase the diversion of fresh water away from the dolphins' habitat and into factories. These factories, while depleting vital sources of fresh water, will also discharge waste water into the ocean. Current methods of treatment of such waste water, and assessments of proposed projects, do not address the full impact of the discharges on temperature, salinity, and other factors affecting life in the area. These problems, in addition to noise and vibration generated by construction and factory operations, and the off shore wind stations planned by Taipower and private companies, are all part of the rapidly accumulating threats to the dolphins' survival. Indeed, the connection between the Sousa's decline and Taiwan's west-coast industrial development appears to be so strong that the health and stability of this dolphin population could be taken as a key indicator of Taiwan's shortsighted and unsustainable economic development. A number of NGOs concerned with long term economic development have formed an alliance to lobby the government, educate the general public, raise money and take other actions to support initiatives to save Taiwan's Sousa from extinction. This alliance has learned from Canadian, Hong Kong, U.S. and Taiwanese scientists working with the FormosaCetus Research and Conservation Group that a panel of experts from the World Conservation Union (IUCN) that recently met in San Diego has agreed that Taiwan's Sousa should be listed as "critically endangered", the same category as the Yangtze River Dolphin (Lipotes vexillifer) which became functionally extinct in 2006. 1. The Executive Yuan should immediately convene a national conference on protecting species, habitat and biodiversity. 2. The Executive Yuan should immediately direct subordinate agencies to evaluate possible impact on the survival of Taiwan’s Sousa by all development projects, and to make the viability of the Sousa a priority in all relevant proposals. 3. The Executive Yuan should immediately direct all relevant agencies to come up with the strictest guidelines possible under existing law, to protect areas inhabited by the Sousa. 4. The relevant agencies of the Executive Yuan should immediately draw up and submit to the legislature conservation plans for this animal, and the Legislative Yuan should approve these allocations at the next opportunity. 5. Judicial and prosecutorial officials should take immediate steps to investigate and prosecute infractions of relevant laws in ways that may adversely affect the Sousa habitat, including prosecution of illegal cooperation between business and officials leading to habitat destruction. Finally, we insist that government officials in the Executive Yuan, legislators and businesses abide by the letter and spirit of the Basic Environment Act, including the requirement that considerations of the environment shall take precedence over the economy, and we remind you that this is not only to protect the "environment" but it is also to protect the long term viability of economic development. Founded in 1946 the IUCN currently has more than 980 members in 140 countries. The Union's mission is to influence, encourage and assist societies throughout the world to conserve the integrity and diversity of nature and to ensure that any use of natural resources is equitable and ecologically sustainable.